The four biggest stars among twentieth-century Italian tenors were Caruso, Gigli, Corelli and Pavarotti. Gigli had the sweetest voice, but he was a Nazi collaborator. Not only did he write a book, Confidenze, praising Fascism, not only did he allege a Jewish conspiracy, not only did he help Mussolini supplant the native culture in Slovenia by singing performances there, not only did he write, “Adolf Hitler and the ministers Goebbels and Goering have honored me with their friendship,” but he also collaborated with the Germans after they occupied Rome. He even collaborated after they massacred 335 civilians on March 24, 1944. (The event was Italy’s 9/11.) He sang for them, became a go-between, gave them a photo op, helped them create an appearance of normality and an illusion of civilization. After the Allies took Rome in June 1944 Gigli’s countrymen singled him out as a collaborator, and the Allies prohibited him from performing. At the end of 1944 a Roman commission held a hearing about his collaboration—and gave him a slap on the wrist. In 1945 he wrote a second book, La verità sul mio «caso,» this time to exculpate himself. Although he was able to resume his career his reputation in Italy was soiled. The U.S.S.R. would not let him into any country under its control. The U.S. wouldn’t allow him in either until 1955, when he gave farewell concerts. Why was he a “Nazifascista” and why did he collaborate? He said he was naïve politically. But this contradicts his position in Confidenze—and in 1953 he ran for the Italian Senate, so one wonders about his supposed naïvete. He also claimed he was for Italy no matter who was in charge—but that position fails to shed light on his behavior during the Italian civil war of 1943-44. His personal life was stormy. He had nine children, two of them legitimate, and for twenty-three years maintained two families concurrently. His daughter soprano Rina Gigli discusses his relationships candidly—as well as singing with him for Hitler. Gigli perfected chiaroscuro like no other singer since the dawn of recording. He achieved chiaroscuro by contrasting loud with soft singing—chiaroscuro of dynamics. But he also contrasted open, closed and covered tones—chiaroscuro of timbre. This last was his great innovation. 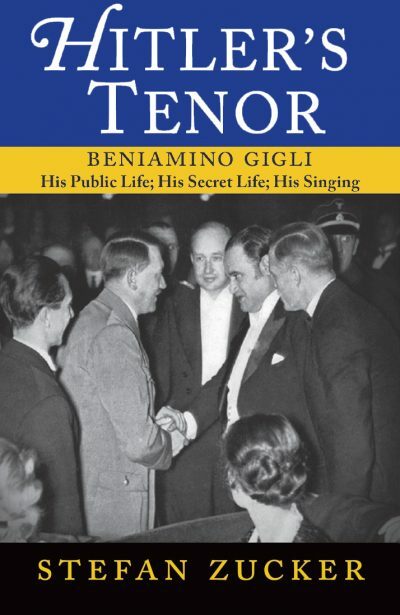 The book discusses Gigli’s twenty-eight films and hundreds of recordings as well as his rift with The Metropolitan Opera and is full of photos. During the March 30, 1991 broadcast I refer to my article on vibrato, reprinted here. The use of fast vibrato as a prominent aspect of each sung tone was pioneered by tenor Giovanni Battista Rubini, beginning around 1814. Before him singers reserved vibrato for special effects and moments of heightened emotion. At first, because of vibrato, Rubini was derided as a goat. He could not find employment as a recitalist or opera singer–not even as a chorister. Eventually by virtue of a masterful singing technique, unsurpassed musical sensitivity and a most magnetic vocal personality he became his age’s preeminent singer, despite an objectionably small voice. Even Chorley had to concede that, with vibrato, Rubini produced “an effect of emotion not obtainable by any other means.” His tones even came to be widely admired for their beauty. In this country as well as Britain critics and public have tended to think of this quiver as disfiguring. When De Lucia and soprano Celestina Boninsegna appeared here, in 1893-94 and 1906-07, respectively, critics called each a goat. Baritone Riccardo Stracciari was excoriated here for the same reason, in 1907. Virtually all Italian tenors who appeared here from the 80s to the First World War vibrated and in consequence didn’t become really popular, even those with illustrious careers in Europe, such as Campanini and Stagno. When the adulated Jean de Reszke on occasion lapsed into such a vibrato at the Met, even he was scourged. Enrico Caruso was found refreshing when he made his Met debut, in 1903, because, so critic W.J. Henderson noted, his voice was “without the typical Italian bleat.” (Henderson once wrote, “To make the voice quiver with imminent tears all the time is ridiculous.”) Although Caruso’s vibrato on his early records does seem moderate when compared to other Italian tenors then, it is faster, narrower and more flutterlike than on records he made 15 or so years later, where it is comparatively slow and wide. The fortunes of Aureliano Pertile and Giovanni Martinelli exemplify a difference between Italian and American taste of the past. Both tenors were born in Montagnana, Italy, in 1885, both were impassioned. Pertile was received coolly here, in 1921-22, perhaps because of his “bleaty” vibrato-laden tone. Martinelli, a Met stalwart for decades, had almost no audible vibrato. When he returned to Italy in 1929 he was crucified for having la voce fissa, a tight or constricted tone with insufficient vibrato. Since W. W. II few Latin singers have had prominent vibratos, with the exception of throwbacks such as tenor Salvatore Fisichella, indifferently received at his Met debut, in 1986, and tenor Bruno Beccaria, whose vibrato is reminiscent of Pertile’s. In the late 50s Franco Corelli, who had begun his career with a prominent vibrato, eliminated it, regarding it as a flaw–a sign of the times. Magda Olivero, a heavy vibratoer in the 30s, used comparatively straight tones after 1950. With some exceptions Afro-American singers have a different kind of vibrato, slower and wider. Marian Anderson and Leontyne Price are examples. To study vibrato, it’s helpful to play tapes at half speed. To serve music vibrato’s width and rapidity must be capable of variation. For me the main objection to omnipresent vibrato is that pitch fluctuations interfere with resolutions of dissonances and other moments of harmonic repose. In florid music vibrato, moreover, creates ambiguities of pitch. Still, the allure of Conchita Supervia does seem to stem in part from vibrato. Although the British dislike vibrato in singing, old-time Oxford philosophy dons were given to talking with voices aquiver with emotion. As a graduate student I heard one such deliver a highly abstract and rigorous lecture on truth theory in a manner worthy of Pertile. On early records and sound films a number of orators, politicians and actors also speak with vibrato, as did Evans and Gielgud in Shakespeare. According to former Milanov student Linda Kundell, of New York City, Milanov taught that one should sing each vowel with the mouth position for “oh,” with the lips formed into a spout. (Conversation, November 16, 2008) This is another way to round or darken. Soprano singing has changed in various ways during the last 70 years. Here’s one aspect, illustrated by Mirella Freni and Katia Ricciarelli from the 1970s onward. Their sounds were very different from those of most Italian sopranos prior to W.W. II. Those women for the most part didn’t sound mellow or creamy. (Claudia Muzio began to cover her tones as she aged, and Rosa Ponselle covered from the start, but they were exceptions, as were Iva Pacetti and Mafalda Favero, who rounded or darkened, along with such Germans as Tiana Lemnitz and Maria Ivogün.) Most pre-war Italian women didn’t round or darken their tones, as did Freni and Ricciarelli. Freni-and-Ricciarelli-like sounds may fall kindly on the ear but the price is monotony. Unrelieved rounding or darkening limits expression and irons out tonal nuance. Rounded or darkened sound is less youthful. To convey girlishness Freni herself sang Micaëla with an unrounded or undarkened sound, heard on a Carmen (available as a download or CD). But that was in 1959. Iris Adami Corradetti taught her pupil Ricciarelli to round or darken. But in recordings made in 1940 Adami Corradetti herself did little or no rounding or darkening. In her recordings from the 50s, however, she did. These singers presumably were trying to accommodate modern taste: rounding or darkening and to some extent covering are now expected worldwide. But undarkened, unrounded, uncovered sounds sustain interest better. Listen to Bianca Scacciati, Adelaide Saraceni, Maria Carena or Augusta Oltrabella, none of whom rounded, darkened or covered. If you’re not accustomed to them, you may find their top notes acerbic and even piercing. But the result is more characterful. At the opposite pole from rounded or darkened singing is the voce infantile, a “white,” childlike sound, useful for expressing innocence and fragility. Toti Dal Monte, Lina Pagliughi and Maria Zamboni are three who always sang with the voce infantile, sometimes with a charming and playful result otherwise unobtainable. Tones sung with the voce infantile are open, and open tones sustain interest (whereas covered sounds in and of themselves do not). Even so, the use of the voce infantile for everything can limit expression. Consider the second and third acts of Dal Monte’s Butterfly, where the voce infantile becomes less appropriate as the tragedy deepens. Whether or not Dal Monte continued to sing with it out of interpretive choice is unclear. Notwithstanding the expression-limiting effect of pervasive rounding or darkening, not to mention that of pervasive covering, and the expression-limiting effect of using only the voce infantile, singers still can be expressive through musicanship, vocal acting and fuoco sacro. The story of music in the Third Reich is a sad one, showing on the one hand how a totalitarian dictatorship maneuvered artists into painfully difficult moral situations and revealing on the other how badly most of them behaved in those dark times. Yet music lovers today often are unable to make a distinction between these artists and their art; they perceive in the arts the highest achievement of humanity and unconsciously slide into the notion that the practitioners of those arts were themselves a special type of person. Talent is mistaken for character. Nothing has muddled the discussion of musicians in the Third Reich more than this confusion. Moral accountability–not just artistry–is the issue in the context of the time; and by their deeds–political as well as artistic–these artists must be judged. Artists were on the forefront of the Nazis’ ambush on power in 1933. To this day most people remain unaware of how tightly the Nazis harnessed the arts to their political system. Culture was of the utmost personal importance to the Nazi leaders, many of whom themselves were failed artists–Hitler a painter and architect manqué as well as a passionate Wagnerian, Goebbels a would-be novelist and playwright, Göring a gluttonous art collector, Rosenberg a trained architect, von Schirach an aspiring poet. They raised culture to a central position in their so-called “New Order” and used the arts as a means of gaining legitimacy, respectability and acceptability. Culture was the painted veil behind which democracy was suppressed, concentration camps were opened, books and paintings were burned, racial persecution was carried out and wars were launched. The face of the Nazi system clearly was evident already in the summer of 1933. By then many prominent artists had fled. Those who could have practiced their profession outside Germany but decided to stay must have found the New Order at the very least acceptable. An artist’s relationship to the Third Reich was not necessarily linked to party membership as such. Hitler himself considered artists naïve fools when it came to political matters and did not care whether or not they joined his movement. Many who did so were motivated by professional opportunism more than political conviction; many who declined to join performed exemplary service to the Nazi state. The Nazis sought not just to use music to support their political objectives, they also endeavored to alter the very character of the music performed in Germany to suit their ideology. They attempted to achieve this in three ways: to ban performers and composers who were of Jewish or partly Jewish origin; to forbid all “modernist” music; and to foster German compositions and composers while discouraging (and eventually banning) foreign works. By 1935 official lists were promulgated with the names of unacceptable composers and forbidden compositions. The centerpiece of Nazi policy in the field of music was brute anti-semitism, and this was implemented immediately and ruthlessly. Germans of Jewish background accounted for an exiguous two percent of the music profession in 1933, though their number included many of the country’s leading conductors and composers: Bruno Walter, Otto Klemperer, Leo Blech, Arnold Schoenberg, Kurt Weill, Hanns Eisler, Jascha Horenstein, Joseph Rosenstock, Hermann Scherchen, Wilhelm Steinberg, Eugen Szenkar, Fritz Zweig and Gustav Brecher. Within weeks of the Nazi takeover they–and many non-Jews–were discharged along with singers, teachers, administrators and soloists, such as Arthur Schnabel and Rudolf Serkin. Anyone who was considered liberal, socialist, communist or critical of National Socialism was subject to expulsion from his position. Despite the damaging emigration, however, the quality of musical performances generally remained high. Compositions and sometimes even texts by persons of Jewish or part-Jewish background were banned. Exceptionally, Rosenkavalier and other Strauss–von Hoffmansthal operas survived, and there was no alternative but to tolerate lieder with words by Heine. But Mozart–Da Ponte works were not so fortunate. The texts of these operas were unacceptable doubly since both Da Ponte and the person who had provided the standard German translation of his librettos, the conductor Hermann Levi, were objectionable racially. Several new translations–one of them commissioned by the Propaganda Ministry–were produced and widely performed. Those of Handel’s works based on the Old Testament in some cases were replaced by Nazified versions. At the time of the German invasion of Russia, for example, Israel in Egypt was recast as The Mongol Storm. As part of this racial revisionism scholars completely rewrote music history and produced Aryanized musicology. At the same time music organizations, schools, conservatories and publications all were taken over by Nazi loyalists who promoted the party’s ideological views. A Reich Music Chamber was established–with Richard Strauss and Wilhelm Furtwängler as president and vice president–to forge links between the music world and Nazi authorities. All this was accepted widely and even approved by both the public and the musicians themselves. To be sure, some Gentile artists such as Fritz and Adolf Busch, Erich Kleiber and Carl Ebert left the country in disgust. But most remained, and all of them–from the lowly to Richard Strauss, Karl Böhm, Clemens Krauss, Wilhelm Furtwängler and Herbert von Karajan–were only too happy to profit from the situation. Yet opportunists though they were, many remained devoted to their art above all. Anyone who played an instrument, composed, conducted or sang was contributing, however innocently, to the Nazis’ objectives. Even acts of omission–not conducting Mahler, Mendelssohn, Schoenberg, Berg or Bartok–amounted to active participation in the corruption of music. Worse were those who actively supported the aims of the party. Most unforgivable of all were those who celebrated German military triumphs and the suppression of foreign culture by carrying their art into occupied countries. These were Hitler’s willing cultural executioners. Nazi authorities used musicians to attain propaganda objectives. At home they manipulated artists in such a way as to create the impression that Nazi Germany was the world’s great culture-state. Outside Germany they deployed many musicians as cultural combat troops, to establish German cultural supremacy and to supplant or suppress foreign cultures. Opera companies and orchestras–conducted by Furtwängler, von Karajan, Böhm, Krauss, Knappertsbusch and Pfitzner–frequently were sent on such missions throughout Sweden and occupied Europe. In Czechoslovakia and Poland, after 1939 indigenous musical life was crushed and replaced exclusively by German music and institutions. The Prague Symphony Orchestra, for instance, was disbanded and replaced by the so-called German Philharmonic Orchestra of Prague, under Joseph Keilberth’s direction. Once the war began musicians were given the additional mission of boosting popular and military morale by performing in factories and military units. Even after August 1944, when Goebbels declared “total war” and closed all theaters and concert halls, some musical events still were authorized. After the war almost all prominent artists were compromised politically–and morally. They themselves loudly insisted they always had been apolitical, devoted solely to their art. But in a totalitarian state no one is apolitical, and the practice of art cannot be divorced from the political circumstances in which it takes place. Furtwängler practically is bursting with nationalist enthusiasm. This man has undergone a profound transformation, which it gives me a great pleasure to witness. I fought for years to win him over and can now see success. He…is very willing to put himself at my disposal for any work I may require of him. Please bear in mind that your art was used over the years as an extremely effective means of foreign propaganda for the regime of the devil; that you, thanks to your personal fame and great talent, performed valuable service for this regime and that in Germany itself the presence and activities of an artist of your rank helped to provide cultural and moral credit to those terrible criminals or at least gave considerable help to them….In contrast to that, of what significance was your helpful behavior in individual cases of Jewish distress? Although initially forbidden by Allied authorities to conduct after the war, Furtwängler eventually resumed his position with the Berlin Philharmonic and performed widely outside Germany. Frederic Spotts’ books include The Churches and Politics in Germany (Western Germany After WW II) (1973), Italy: A Difficult Democracy: A Survey of Italian Politics (1986), with Theodor Wieser, Letters of Leonard Wolf (1989), Bayreuth: A History of the Wagner Festival (1994), Hitler and the Power of Aesthetics (2002) and The Shameful Peace: How French Artists and Intellectuals Survived the Nazi Occupation (2009). Just by his participation in dozens of concerts and other events, Furtwängler has allowed the immortal works of the great German masters to be used for National Socialist propaganda purposes. For years he has allowed himself to be misused (witness that the cries of victims in the concentration camps were masked by solemn music). His activity was supposed to insure that the horrific crimes against countless individuals would not be heard and would not be considered possible. If the fight against Jewry is directed chiefly against those who are themselves rootless and destructive, who seek to impress through trash and sterile virtuosity, this is only correct. The struggle against them and the spirit they personify–and this spirit also has its German devotees–cannot be waged vigorously and thoroughly enough. But when this attack is directed against real artists as well, it is not in the best interest of our cultural life. Real artists are very rare, and no country can afford to renounce their services without great damage to its culture. “If the fight against Jewry is directed chiefly against those who are themselves rootless and destructive, who seek to impress through trash and sterile virtuosity, this is only correct. “I knew Germany was in a terrible crisis; I felt responsible for German music, and it was my task to survive this crisis, as much as I could. The concern that my art was misused for propaganda had to yield to the greater concern that German music be preserved, that music be given to the German people by its own musicians. These people, the compatriots of Bach and Beethoven, of Mozart and Schubert, still had to go on living under the control of a regime obsessed with total war. No one who did not live here himself in those days can possibly judge what it was like. The above quotations are from The Furtwängler Record by John Ardoin. The Lux Film Gesellschaft was established by Josef Koppelmann in the late 1920s. Initially Lux brought German films to Austria but later Josef decided to produce Austrian films. After securing the talent of Leo Slezak (who mentions Josef in one of his books), Koppelmann recruited Austrian opera stars, famous actors and cabaret chanteuses who began appearing in his productions and became regular visitors at his home. Among them were Franciska Gaal, Paul Hörbiger, Kurt Weill, Artur Schnabel and Joseph Schmidt. Lux also was the first company to bring talking films to Austria. Ave Maria was shot and recorded by Itala Films in the Tobis Atelier, in Berlin, May 1936. Johannes Riemann directed. Alois Melichar conducted the orchestra of the Berlin Staatsoper. Ernesto De Curtis composed “Soltanto tu, Maria” and Melichar composed “Anima mia” for the film. In the German version of the film Gigli does a lovely job of coloring his speaking voice. The film’s ending begins with the Bach/Gounod “Ave Maria” and segues into the final moments of “Soltanto tu, Maria.” The result is exuberant. In the Italian version an actor does an excellent job of dubbing Gigli’s speaking voice. The film concludes with “Ave Maria”–the ending is sweet and delicate. The Italian version premiered August 17, 1936, in Venice. The German version premiered August 21, 1936, in Bremen, at the Tivoli. The Berlin premiere was on August 28, 1936, at the Ufa-Palast am Zoo (today known as the Ufa Zoo-Palast). We have provided two separate PCM audio soundtracks for both the German and Italian versions of Ave Maria. One track is restored, the other not. Imperfections in the film prints caused pops, clicks and thumps. In undertaking the restorations our philosophy was simple: do no harm. Therefore we removed most of these disturbances but limited ourselves to reducing the impact of others, to avoid dulling the sound or changing the character of the background noise. In restoring the German version we applied broad-spectrum hiss reduction to the dialog but not the music, so as not to compromise its emotional impact. (With today’s technology, you cannot remove hiss without attenuating soft overtones as well as acoustical ambience or “space” around the sound.) The Italian version was less hissy, so we did not de-hiss it. We believe the restored soundtracks are preferable but suggest you compare them to the unrestored tracks and choose for yourself. The main menus on each DVD make this easy. Please be patient and let the movie load in before hitting the play button. Click to see a list of titles with Schmidt or with Slezak as the video clip loads. The German word “vorne” in this context refers to forward, that is to say, mask, placement.